By popular demand, we’ve added squared corners and terminals to the “Connect” brick pack, a total of 27 new bricks. What makes a video game memorable? … wait — typefaces ? Yes, since their advent, video games — whether arcade, home console, computer, or mobile — have relied on text to inform the player of game play instruction, status, current inventory, possible decisions or action options which may be taken, and most importantly: story. As games became more elaborate (better graphics and sound, actual speech accompanying the game’s text, etc. ), their typefaces became more refined and complex right alongside them. However, despite shedding their prior design limitations, they remain an integral and necessary component of the gameplay experience to this day. In the beginning — as was the case with so many video game elements — the technology of the day imposed limitations. 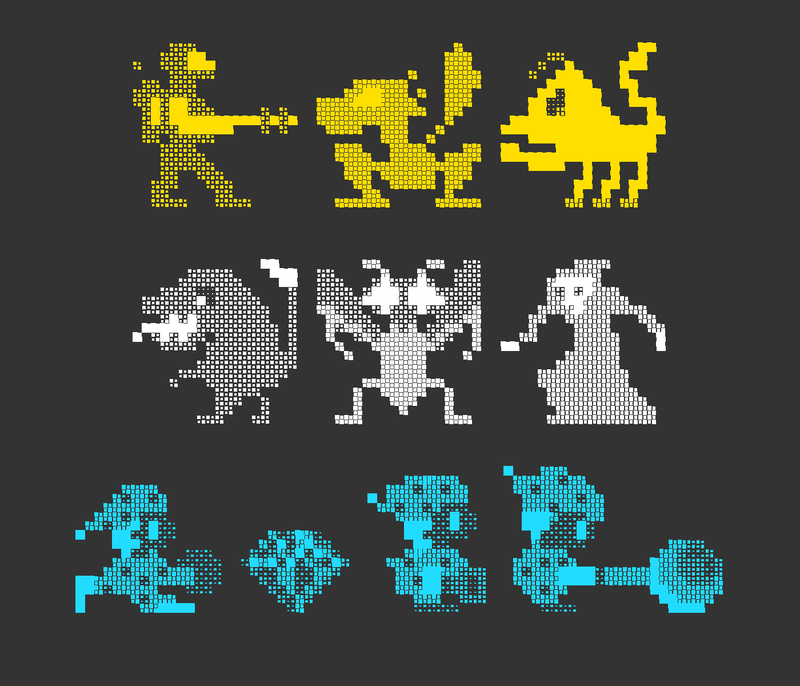 Most early games typefaces used an 8×8 grid for each character (resulting in 64 possible pixels that could be used), but this did not stop creativity. 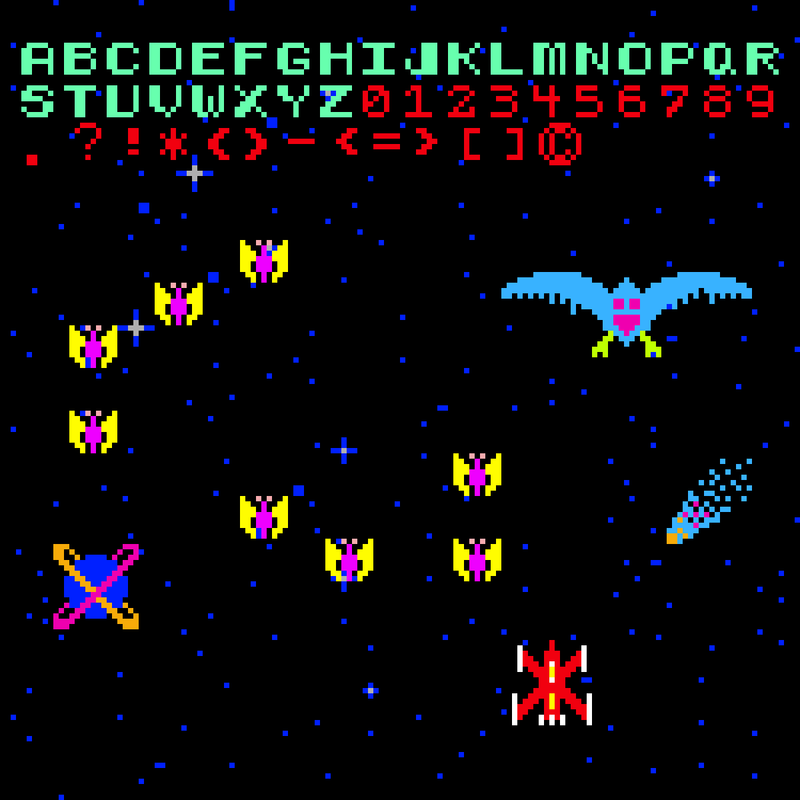 Many arcade games simply chose to vary the ubiquitous typeface that Lyle Rains (of Atari fame) developed for “Sprint 2” (1976), while other game designers created a staggering number of unique typefaces for their games. 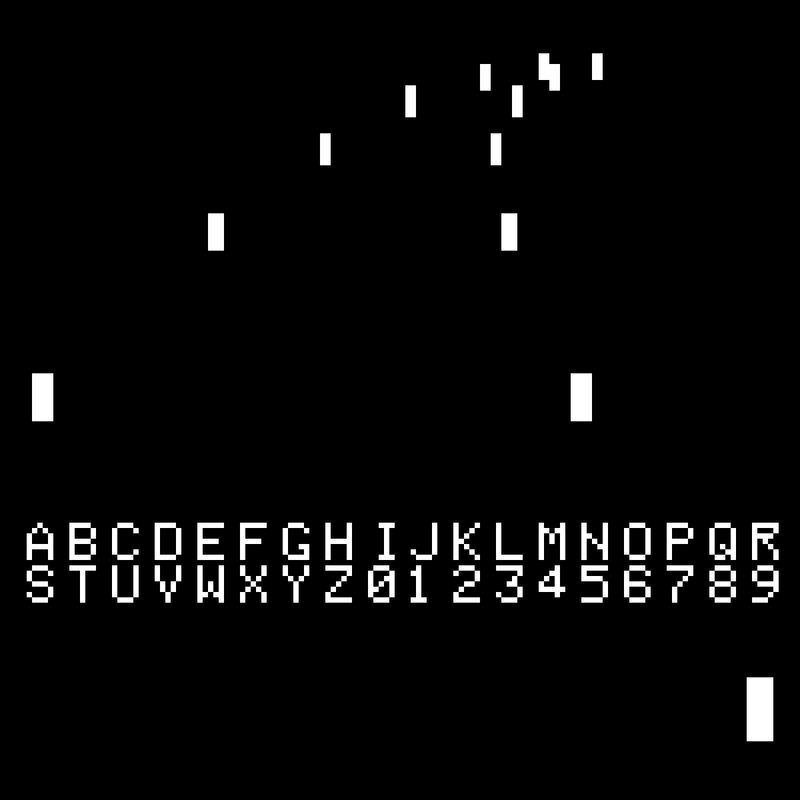 Looking at some of the very early games like “Night Driver” (1976) we can see that the font used was very minimal and utilitarian – likely the work of programmers/engineers rather than actual visual designers, so the emphasis was on readability rather than any expression of design sensibility. 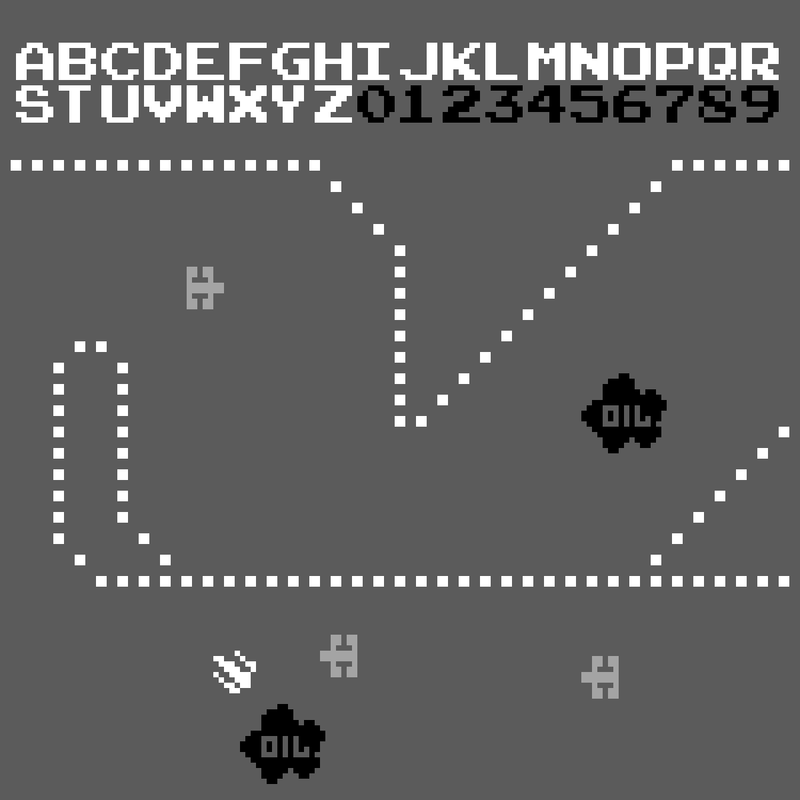 But there are already some early examples of fairly “distinctive” fonts like the one from “Phoenix” (1980), which first appeared – in a prototypical form – in “Safari Rally” (1979). The typeface contributions to these games were often overlooked. But we typeface enthusiasts noticed. Although video game typefaces from so long ago may be forgotten to most, we find value in all typefaces — especially those unsung electronic designs of the early days. Unlike books, posters, or other physical print media, video game typefaces are inherently transitory and ephemeral. They are not permanent and only exist during game play — or at least while the game has electrical power and is switched on. Due to the ageing technology of early gaming systems, the game typefaces from those early days are now unfortunately trapped on old coin-operated arcade game boards or outdated 20-to-40-year-old home consoles. However, we are more fortunate with certain computer systems that spanned roughly that same period; industrious amateur programmers have endeavoured to keep those games alive, regardless of however advanced their computer systems may have evolved. 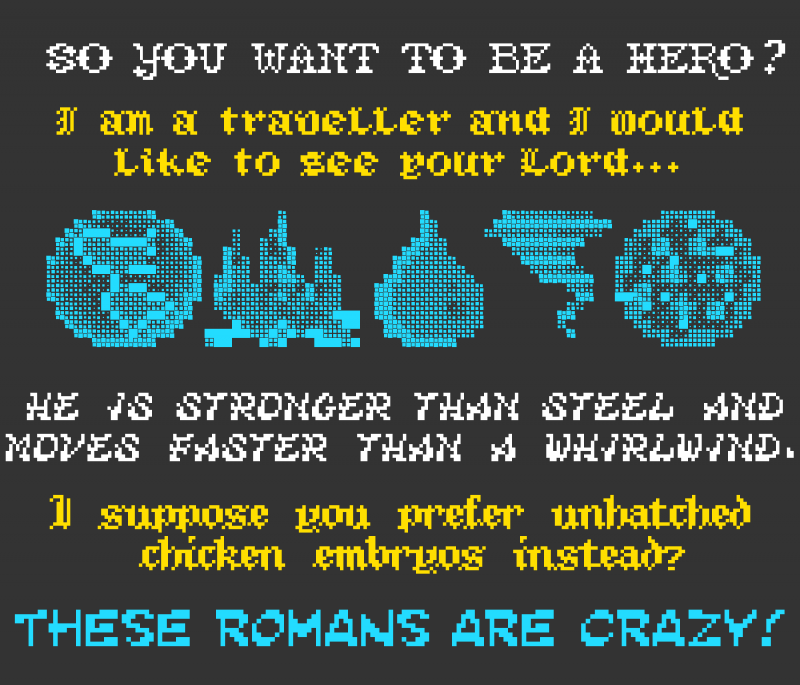 Because FontStruct utilizes a modular grid system with the simplest brick being a square block, it’s ideal for recreating (non-anti-aliased) video game pixel fonts. And there are many FontStructors who have made it their mission to rescue these lost and forgotten typefaces, to revel in a bit of nostalgia, and to allow others to experience the inherent beauty of these designs made concrete. And now, with the newly introduced “Game Recreations” archive, two veteran computer and game font recreation enthusiasts – Goatmeal (see our previous mini-interview) and Patrick H. Lauke (Redux) – aim to collect and showcase some of this work. The Video Game Font Preservation Society™ awaits your contributions! Thanks Patrick H. Lauke (Redux) and Goatmeal! 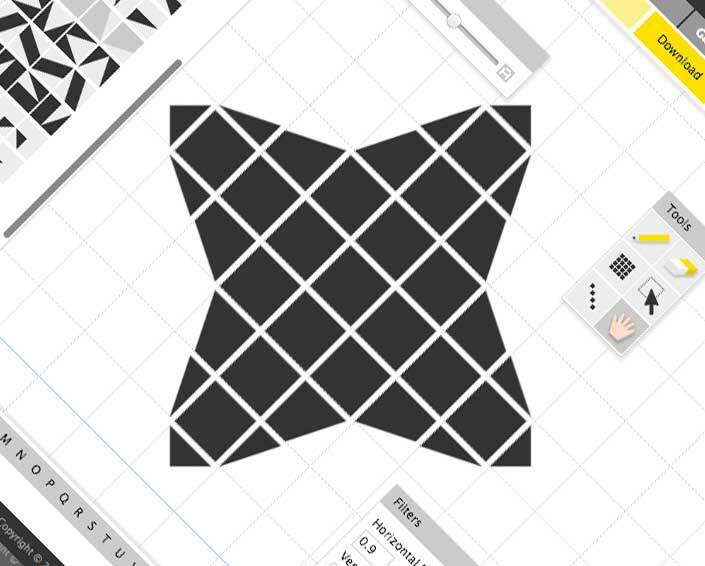 From the very beginning, FontStruct has tried to be easy-to-use and avowedly non-technical for its font-designing users, but of course there is a great deal of technology behind our platform, and today we’re open-sourcing a small, but important part of it: the core of our font generation module. There are several reasons for open-sourcing this code. It offers other developers an opportunity to contribute to the font-generation side of FontStruct. 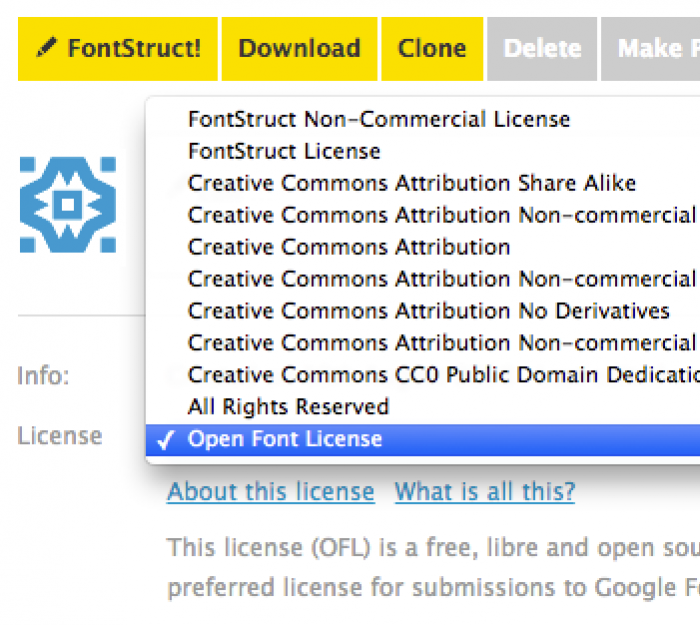 It also offers others a new tool to assist them in building their own font-generation tools. But the main motivation for sharing the code is the desire to give something back – in the form of publicity and a software library – to an open-source project (Haxe) which has been extremely helpful to us in recent years. If you are interested in software development and FontStruct, please read more about our new open-source library and the some of the history of FontStruct’s development on Medium. By popular demand we’ve added four new bricks to the core brick pack today. They are half-arc shapes in three thicknesses to match the existing arc or “macaroni” bricks, plus the so-called “pizza-slice” brick. Thanks to everyone who proposed and argued for these additions. Unlike other bricks we decided to include only a single orientation, rather than the usual set of four rotated variants. Another fun-packed competition is complete, leaving us to celebrate a wonderful assembly of diversely-inspired and inspiring entries. As so often in previous competitions, there are simply too many high-quality entries to give each and every one the attention which they merit, so I’d like to congratulate all participants on their creativity and skill, and encourage everyone to have a long look at all the entries to discover those many gems which are not featured in this post. ▲ from top to bottom, nocturnal by time.peace, KD Spaceband by architaraz, and Connect 42 by jonrgrover. – I don’t entirely see how nocturnal addresses the “counter” theme, but, nevertheless, it’s a beautiful, clean design from FontStruct’s master of filigree, Art Deco design: time.peace. architaraz’s KD Spaceband meanwhile is perhaps the most original and usable entry of all, cleverly exploring and reinventing the spaces enclosed within its glyphs. Connect 42 by jonrgrover represents all those competitors who chose to explore the gaming counter metaphor, and it’s a simple but playful entry. ▲ zcrapedium eYe/FS by elmoyenique, N8Lite by nightpegasus and Serifia la printe by JingYo. – I profoundly love the tattered geometry of zcrapedium. So much so, that you’ll find it lurking in the background of every sample within this post. The variants in the upper case are a great idea, and I can think of plenty of real-world applications for this one. Below it: the mysterious N8Lite – but who is nightpegasus, its designer? I have my suspicions. Whoever they are, they demonstrate a highly idiosyncratic and expectation-confounding style, of which N8Lite is a great example – rule-bound yes, but how strange and elusive are those rules! Serifia la printe represents a larger group of excellent, more “classical”, filled-counter entries. “Serifia” contains many surprising, and indeed inconsistent, design choices, but therein lies the strength of its oddball character. – All three of these entries would likely have fared very well in the Inline Competition. fs psyline and KD Hachure are examples of sophisticated and mature FontStructing – ready to be moved on into the character-set expansion phase and suitable for all kinds of design applications. Below them. the charming and ingeniously entitled Owl Circle by Waturu Aiso has a more mannered, fantastical look. Last, but not least, in this short and selective tour, we have a group of three diverse entries, beginning with NAL’s Zirconia – its glyphs like the aerial view of an extra-terrestrial base, revealing its intricate, bevelled construction only at larger point sizes. Geometrica B&L turns out to be barely legible, so it’s probably best suited to a logo or short headline, but the patterns of its semaphore-like, cuneiform patternings are wonderful nevertheless. And finally, geneus1 offered us an array of exceptional contributions to this competition– all expertly-crafted, things of beauty. You really have to install G1 Recoil and start playing with it, in order to fully appreciate the richness of its ornate strudel. Definitely a recommended download. “breach” by four is a standout winner and the “FontStructor’s favourite” for the “Counter” competition. An ingenious warping and rupturing of the boundaries between interior and exterior space, it’s a thought-provoking work of art in itself, and invites extended contemplation. UPDATE: Some twitter users have pointed out a similarity between “breach” and the very beautiful commercial release “Clip” from Setup (previously Urtd). Personally I suspect and see coincidental inspiration rather than imitation, but please visit the Setup site and make the comparison for yourself. O yes! This was love at first sight. Starbird by V.Sarela (Yautja) is a perfect example of what one might call “groovy deco”, and I can easily imagine it gracing the worn cover of some favourite ’70s sci-fi paperback. The contrast of the fine circle with the smooth and heavy fill beneath it is quite sumptuous. Elmoyenique’s zykowarfare reminds me of plastic letter stencils – incorrectly yet playfully filled out perhaps, at the back of a classroom on a hot afternoon. There are scores of intriguing nuggety forms to discover in this one, hidden away amongst its self-interlocking glyphs . That’s it! Congratulations to all our winners and everyone who took part! The rules at the head and foot of this post are built with “Counter Top” by geneus1. 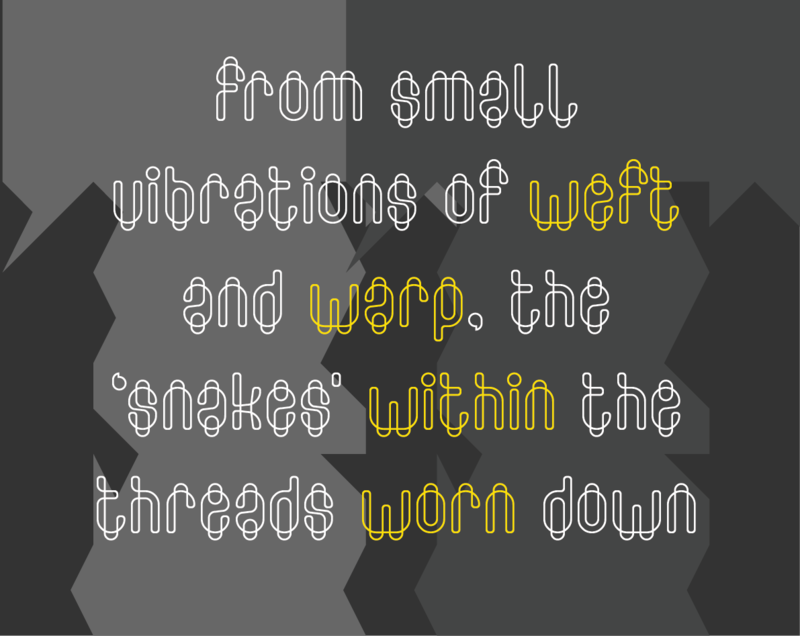 The text in the samples is from “Figures in the Carpets” by David Schloss. Many thanks, as always, to our current sponsors: Google Fonts. Who says referendums are a threat to true democracy? In the perfect world of FontStruct, they work beautifully. Before we’ve even started, we have a winner! What should be the theme of the next FontStruct competition? Our theme is Counter: “the area of a letter that is entirely or partially enclosed by a letter form or a symbol (the counter-space/the hole of)” as wikipedia describes it. What goes on within those little pools of nothingness inside your letters? Are they empty, or filled? Does their surface swallow all light, or shimmer or glow? Of course you can choose any other sense of “Counter“ (arithmetical, political, military etc) if you wish. – You don’t have to pursue the typographic angle. Potential sources of inspiration could be our sets: “Filled Counter”, or “Pattern Fill”. Your submission(s) must be posted and made “public” between 8th May 2018 and 1st June, 2018. Although you are encouraged to share your submission(s) at any time between these dates, your FontStruction submission(s) must be public (marked “share with everyone”) no later than 1st June, 2018 at 11pm PST. Additionally, your submission(s) must remain public at least until 10th June 2018 in order to give the judges enough time to review all qualifying entries. Your submission(s) must be downloadable. If your FontStruction cannot be downloaded, the submission will not be including in the judging. Your submission must be a newly published FontStruction. Simply adding the “CounterComp” tag to an already published font is not allowed. No letters in each submission can be MORE THAN 48 grid squares high. All qualifying FontStructions will by judged by the FontStruct staff and guest judges between June 2nd and June 9th. Three prizewinners will be chosen. One of these will be the FontStructors’ Favourite. Winners will be announced in a FontStruct Blog post on Monday June 11th. Each winner can choose a t-shirt printed with a FontStruction glyph of their choice. The valid entry with the greatest number of legitimate favourites at 11pm PST on 8th June 2018 will be one of the three prizewinners. May the best FontStruction win. 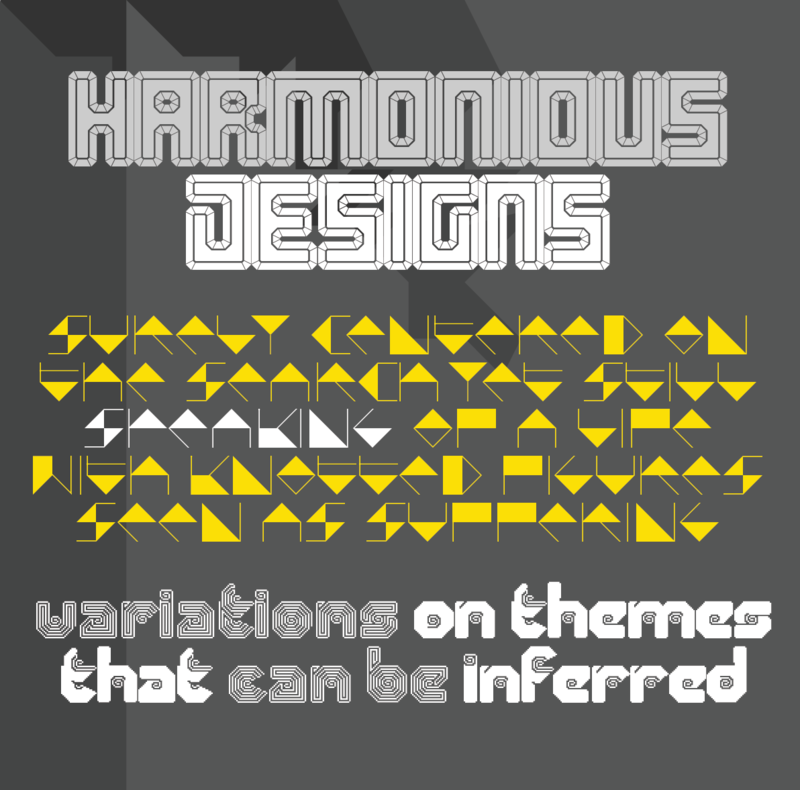 Fontstructions used in the image above, from left to right: zyrup eYe/FS by elmoyenique, the pattern exchange by four, Masthead Black by oliviajohnson, tm Bulba by thalamic, Dizz by geneus1, Sleepless by four, and soundwave by escaphandro. ▲ tm Fest-iv by thalamic. published today, on our 10th anniversary. FontStruct is currently on tour in Granada, Spain. On a cool but bright spring morning, I’m sitting in a roof garden in the old Arab quarter, the Albayzín, staring at the magnificent medieval, hill-top palace of the Nasrid dynasty: the Alhambra. About 700 years ago, the finest arab mathematicians and local craftspeople joined forces here and colluded to create the complex, honeycomb ceilings for the sultan’s private chambers. Selecting and arranging from a limited array of simple, geometric building-blocks the architects created a dizzying, recursive edifice, like a vast, heavenly city suspended over the visitor’s heads. Were these designers, perhaps, the first FontStructors? Did they love and curse their little prismatic “Muqurnas” shapes and their limitations just as we love and curse our bricks? Did they leap up and scream with joy when they discovered a hitherto unthought-of combination of forms? 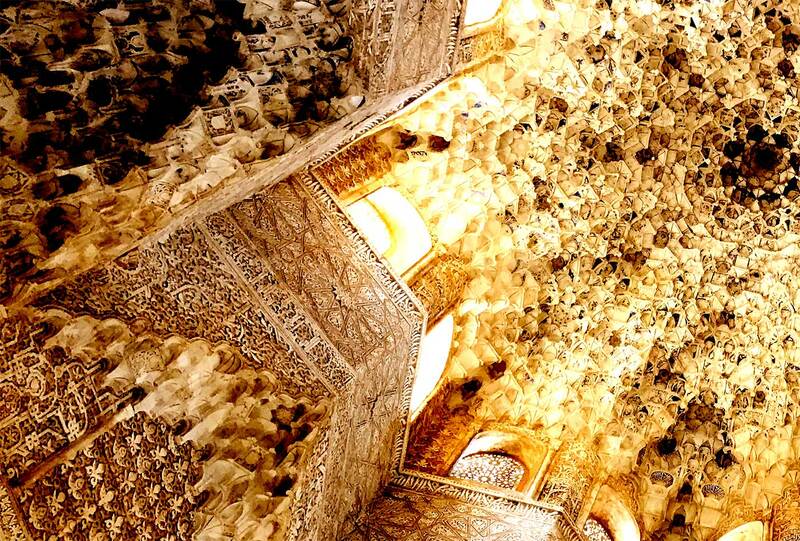 If you are a FontStructor who has visited the Alhambra yourself you may well feel empathy with its architects’ profound passion for geometry; their predilection for modular building techniques and their love of decorative scripts. 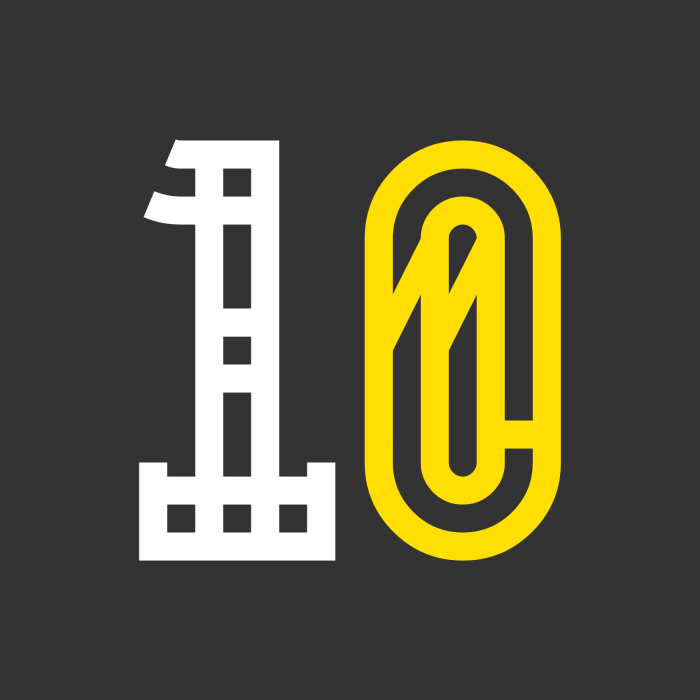 Today, with FontStruct’s tenth anniversary imminent, we’re delighted to announce that Google Fonts will be our principal sponsor in 2018. The OFL is an open-source license, designed specifically for open-source fonts, and is suitable for designers who would like to make their work freely available with zero restrictions on use, modification or distribution. But this is more than just another option in the licensing menu. The OFL is the preferred license for contributions to Google Fonts’ renowned and robust directory of open-source, designer, web fonts; so it’s just become much, much easier to contribute your designs directly from FontStruct to Google Fonts. At time of writing, there are few (if any?) modular, grid-based fonts on Google Fonts. We’re eager to see the first FontStructions appearing on fonts.google.com in 2018, and we hope that some of you will soon be enjoying the massive, global exposure and the state-of-the-art, zero-cost, webfont-delivery service that Google Fonts provides. How can I contribute my FontStruction to Google Fonts? It must be an original design, and of good quality (the ultimate judges of this are the Google Fonts team). It must be licensed under the OFL. It must contain, as a minimum, the 215 glyphs listed by Google. (with the exception of the last 3). 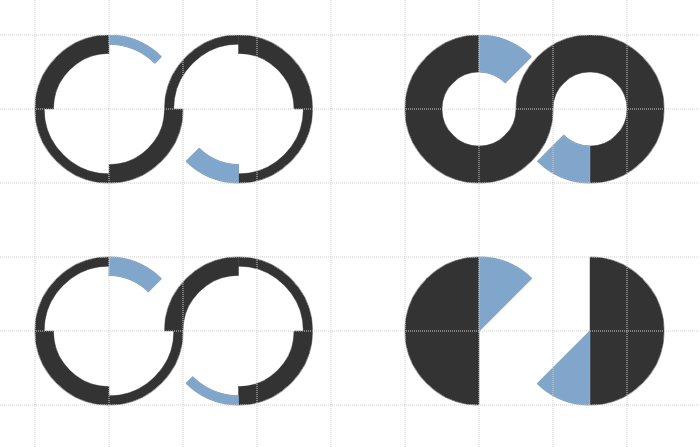 You’ll notice these glyphs are now listed as a special character set in the FontStructor. It must have a simple and unique name, with no copyright or trademark infringements, no initials and no abbreviations. Once everything is ready, you can use the new “Contribute to Google Fonts” button on your FontStruction homepage to start the contribution process. You will find a new section in our FAQ with a detailed, step-by-step guide to help you get started with contributing your FontStruction to Google fonts. Please read this guide thoroughly before proceeding. There’s also a dedicated contact channel for any further questions on this topic. We’re looking forward to a very exciting year. FontStruct would like to thank our sponsors: Google Fonts – Making the web more beautiful, fast, and open through great typography, and Creative Fabrica – your number #1 source for premium design elements. Will you ever disappoint? This time you were faced with what seemed, at first glance, a relatively staid and technical theme: “serif”. Nevertheless you rose to the challenge, with your inimitable imagination and energy – endlessly riffing, playing and transmogrifying to produce a magnificently rich and diverse array of 58 entries – a record haul for a FontStruct competition. Many thanks and congratulations to everyone who entered. Judging was more difficult than ever, but, thanks to the excellent input of our guest judge beate, we finally reached consensus. G1 Radia was a unanimous choice of the judges. With it’s high-contrast strokes, ball-terminals and discreet little serifs this FontStruction genuinely radiates a curvesome beauty, although on closer inspection one also sees intriguing traces of its cruder, modular roots. All four winners actually made multiple high-quality entries, some of which we couldn’t resist including in the samples, so below G1 Radia you can also marvel at the monumental G1 Valora – one of the serifiest serifs this side of the Pecos. 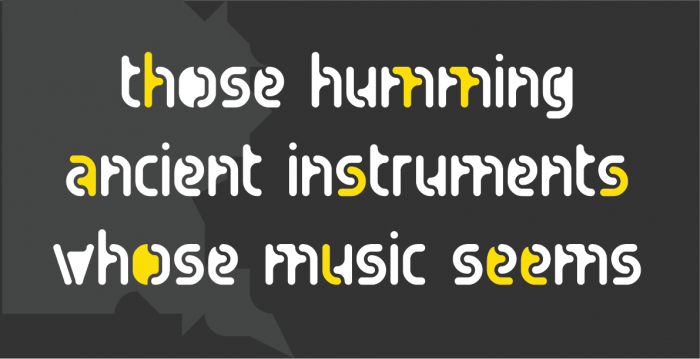 Hoek was elected by the FontStruct community as the “people’s favorite” . It obviously stems from a clear and precise concept for a bevelled slab, thoughtfully executed in every perfect detail. In fact, the judges were even more excited by the highly-inventive “elza” (the second design featured above) in which wiry strokes terminate in a questioning hook-shape rather than a traditional serif or terminal. Planetarium, also shown above, was another strong and popular slab entry. The judges were enchanted by Cembrel B: a subtle, attractive, and eminently-usable, high-contrast serif, part of a developing new family. Nouveaumbre was another really excellent entry from yautja. A classifier’s nightmare: a slab serif concealed inside a sans! – what an innovative interpretation of the theme. Beyond the high concept, architaraz also succeeds in delivering a coherent and attractive typeface. 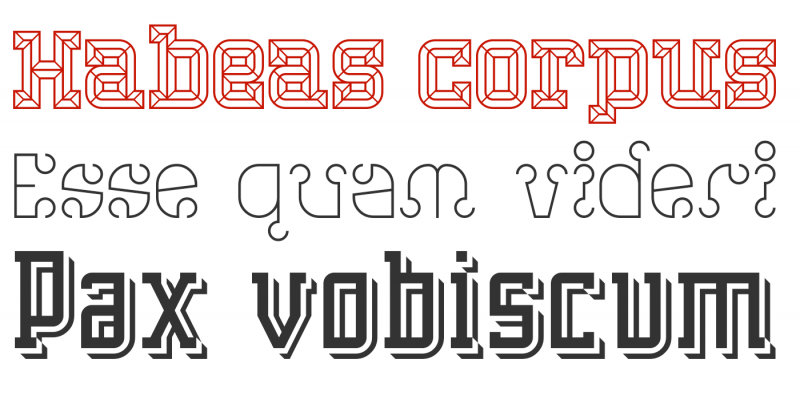 Beneath AT Bals you can see the elegant inline ”AT Migdalia” with it’s hairline serifs. Many, many congratulations to our four prizewinners. – A classic serif with an unusual calligraphic twist, created on a pin-board matrix. – A convivial, super-chunky slab-serif, given added character by the idiosyncratic snips in certain letter-tops. – Actually I’m not sure whether this is (at least in any sense known to me) a serif, but a strong, clear design nevertheless. – One of three strong entries from the master of the dotted font. 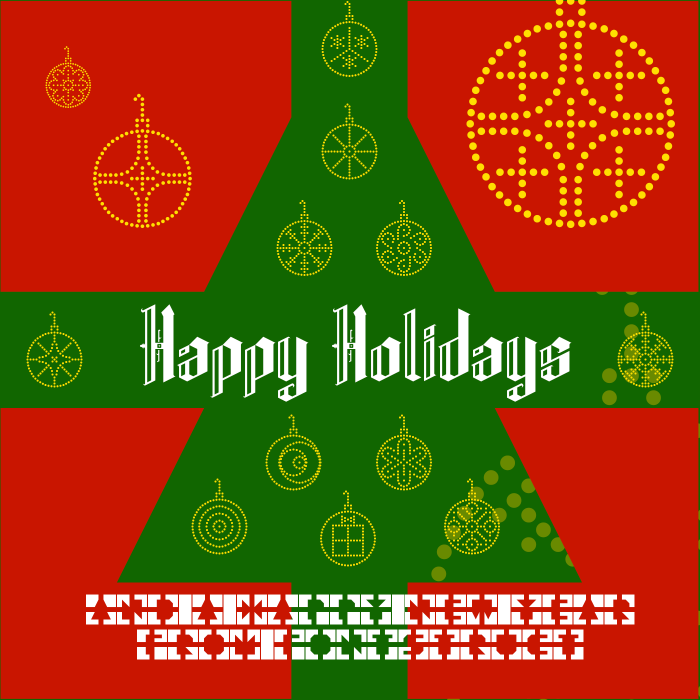 Some really charming glyphs in this one. – Ultra-high-contrast strokes and serifs in a stencil-flavoured entry. – Calculated, cutout crudity. Shamelessly modular and yet also wonderfully imperfect. This brutal disfiguration of an existing design by Sychoff came very close to a prize. Although tagged as punk, there’s also something quite primitive and ancient going on here. I can see these glyphs scratched into the base of an amphora, or perhaps arranged in the border of a mosaic. Compare the Jekyll to this Hyde. Congratulations again to all winners, who will be contacted about their prizes in the next few days; thanks to our judges; and, most of all, thanks to everyone who took part. I look forward to our next competition.